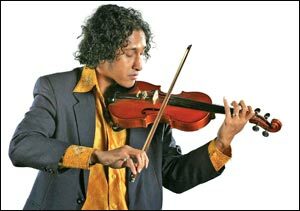 Remember Dinesh Subashinghe, the Sri Lankan musician who set off on a scholarship to Oscar Award winning musician A.R. 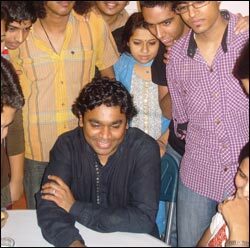 Rahman's Music Academy in Chennai? He is back in the island for a brief spell. recordings in AM Studio, Chennai. I played Tamil and Telugu movie music composed by G. V. Prakash," the enthusiastic young man unraveled his experiences in Indian soil. He was later invited to join the South Indian Cine Musicians Union which compromises some of the most talented musicians in the country. By attaining the membership Dinesh set another milestone in Sri Lanka's music history and his own career by becoming the first Sri Lankan to join the union. "I received a number of opportunities to try my hands at different streams of music. Our lecturers were mostly from USA and Europe. They taught us the origins of musical history, theory, music appreciation, audio technology, conducting, sight, singing, and choir. I chose the violin as my main instrument," he noted, expressing his passion for the stringed instrument played with the bow. He also focused on Hindustani music as a secondary subject as he wished to better his knowledge and skills in different genres of music so that each of his pieces will be nurtured with diverse forms of art from around the globe. Speaking about his teachers in general Dinesh revealed that his history and harp music teacher, Alison, was the music score writer for Danny Boyle's hit movie 'Slumdog Millionaire'. She had also worked as an Assistant Music Director for many projects. Another teacher, Edith Martin, performed the cello for Yashraj movie Yuvvraaj which starred Katrina Kaif. He noted that the mesmerizing melodies which haunt the film, played by Kaif's delicate hands as seen on screen, actually transcended from Martin's cello. "Many globally renowned musicians come to harness budding musicians at the academy. Rahman's dream is to bring the school to match the levels of some of the top Music Academies in the US. He also plans to establish a symphony orchestra encompassing the most gifted musicians of the era," Dinesh expressed some of the ideas that India's music maestro had shared with them. Dinesh had met seasoned vocalist S.P. Balasubramaniam and reputed percussionist Sivamani during his stint in India. Balasubramaniam had been in acquaintance with maestro Premasiri Khemadasa and had even rendered his voice to some of his tunes in movie background vocals. He had been devastated to learn of the Sri Lankan music genius' death. Similarly Sivamani too was shocked to receive the news of past friend, Sri Lankan percussionist, Nelson Thiagaraja's death. It dhows that Sri Lanka and India have had decades of a tuneful friendship. "I performed with M. Kalyan, Narasimhan, Srinivas Murthy and Shekar. All of them have played significant roles in Rahman's pieces. I'm grateful to President Mahinda Rajapaksa, Ven. Athuraliye Rathana, my family, friends and the media for helping me to achieve success," he added. Though he was away from home the gifted musician had not lost contact with the local art scene. He had composed music for Sirasa TV's upcoming teledrama Chandratna Mapitigama's Sundarai Premaya during his stay in India. Sahil Jeeth and Priya Andrews, students of Rahman, have rendered their voices for the song backed by a chorus. The track was arranged by talented pianist Rachintan Trivedi. Significantly Dinesh had included the harmonica for the first time in his music compositions. This is played by Anand Veer Singh. "Priya is the great granddaughter of Indian emperor Akbar and empress Jodhaa. She is an immensely talented vocalist. We are planning to get together with Sahil and another student who is a gifted drummer, to start a band," Dinesh elaborated his plans for 2010. He clinched the award for the best music director at the Signis (OCIC) Awards for the tunes he composed in the 2008 teledrama Siri Sirimal recently. The teledrama directed by Sunil Costa was based on Mark Twain's novel 'The Adventures of Tom Sawyer'. "I am continuing studies on Sri Lankan music and have composed the melodies for Sriyani Amarasena's new teledrama Thumpath Rana which is telecasting on TV. Sanjaya Nirmal, Sunil Costa, Joseph Jerome and Mapitigama have also expressed their desire to work with me. I am looking forward to giving the best of myself for music," the energetic musician concluded with a smile. All these triumphs and well wishes are en encouragement to the youth who pioneered the process of bringing the island's age old musical string instrument, the Ravanahatha or the Ravanastron to the modern musical sphere. Dinesh will return to India for his second session at the Rahman's Academy at the beginning of January 2010.